These ball joints are specifically made for the front control arms for the Superformance® Mk-III Cobra replica. Thus the name, Super Joints! Choose from 2 unique offerings for your Superformance Mk-III. The Geometry Correction version directly replaces your original style ball joints, but also changes the upper and lower control arm angles to reduce bumpsteer and enhance hi-speed stability and safety. The newest version of the Ultra Smooth option includes all the features of the above with the addition of all hand lapped, polished and precisely hand fitted internal components. The new Super Ultra Smooth-II upgrade features all load bearing surfaces high pressure 350,000 psi industrial Cerama-Coated to provide the smoothest, least restrictive and lowerst wearing bearing action even under the highest stress environments for the smoothest steering ever! Use the Installation Socket to install the ball joints. DO NOT use an adjustable wrench or other non-specific tool. This very special sockets fit these ball joints. 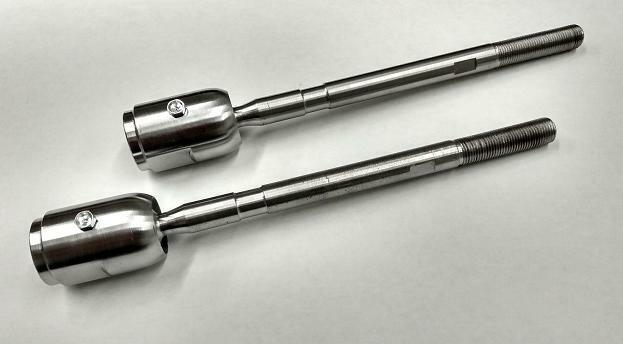 Use optional Ball Joint Adjuster Tool set to fine tune, reset ball joint clearance & pre-load to adjust for normal wear & use. Use our new Polyurethane Ball Joint Boots INCLUDED with your ball joints to seal the ball joints properly from the elements & to hold the lubricant in. These are direct replacements joints for the Superformance® Mk-III. Over 50,000 miles on our ball joints and more than 600 cars in service still, they're still performing awesome! /ea. Upper or Lower Adjustable - Already Preset! Your new R/T ball joints have been painstakingly & individually assembled & the extremely precise & sensitive ball joint pre-load has already been pre-set for you, by hand, one ball joint at a time! R/T's JOINTS DO NOT NEED ANY ADJUSTMENT OR PERIODICAL REBUILDING! Just Install and ENJOY FOR TENS OF THOUSANDS OF TROUBLE FREE MILES!!!! and oversized control arm threads the ball joint housing screws into. 1 pre-cut conical shaped annealed shim to restore stud height on worn and oversized spindle holes the ball joint stud slips into. Ultra Smooth-II Extreme Ball Joint OPTION! We also offer individually machined, hand fitted, hand polished, individually blueprinted and hand assembled Ball Joints. These very special Ultra-Smooth ball joints provide even smoother operation yet, and less friction under higher pressures such as hard cornering at the track, road course and on the street. NEW Super Ultra Smooth-II: are industrial hard coat Cerama-Coated on all load bearing surfaces further reducing wear & dramatically improving lubricity. While our regular ball joints are incredibly smooth already, this very special ball joint option takes precision & quality to the ultimate extreme! This very special added feature of this version is as beneficial for installing these new joints as is the included impressive quality and precision components, making this one of the easiest and most beneficial upgrades like none other. After closely reviewing the diagram below of the Superformance Mk-III front suspension you can see the dramatic benefits of simply installing a set of these Bump Steer Geometry Correction ball joints. The Total Camber change is 42% less keeping the tire squarely planted on the pavement for improved traction while in a corner. The Upper & Lower Control Arm Angles are 88% closer to being parallel with each other. The Total Toe Change during suspension travel is 158% less resulting in less toe out. This makes the car feel less "twitchy" which otherwise is the cause for making the front end of the car "feeling light" at high speeds. This results in dramatically increased high speed stability. This phenomenon of the front of the car "feeling light at high speeds, is really the result of the front of the car lifting up slightly by about 1 inch due to the increased air pressure under the car. When this occurs, the toe in changes from the typical 1/8" toe-IN, to about 3/4 to 1" toe-OUT. When this occurs, the toed out wheels tend to make the car feel as it if it wants to "dart" side to side if you are not holding the steering wheel dead steady. And, it is doing exactly that. And on high speed roads with gentle "whoop-dee-doo's" in them, the increased cycling of the suspension can result in almost 3 INCHES of toe out at full suspension extension! This effect can also take place under acceleration when the rear weight transfer lifts the front and the resulting toe out can make the car feel "wiggly" under acceleration where you would normally attribute all of that to the rear tires trying to kicking out side to side. The steering is actually part of it. 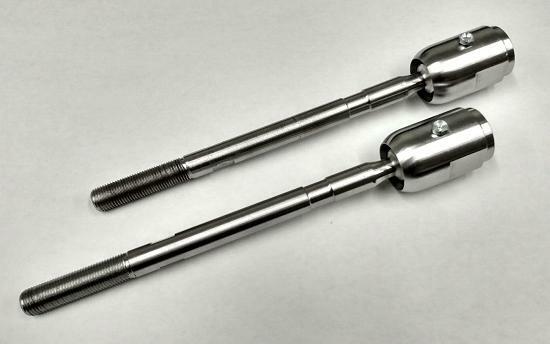 While you can never completely eliminate all bump steer without completely changing all the steering components, rack and control arms, just by adding our Bump Steer Geometry Correction Ball Joints, you will reduce the results of that initial 1" inch of suspension lift to only 1/16" toe out, from 1/8" toe in. That's an improvement of up to 543%. Due to a wide variance from the taper depth in the control arm & the type of original ball joint used, results may vary from car to car. You may need to drop your car about 1/2" down to achieve normal ride height and you will need to realign your front end after the geometry correction takes place. Of course in addition you receive incredible freedom of suspension movement, ease of steering, and smooth operation as well as improved strength, longevity and precise taper stud fit for reliability! A word about "Bumpsteer": Bumpsteer is NOT the relationship of control arm angles compared to tie rod angles. IT IS the relationship of respective control arm ARC of travel compared to tie rod ARC of travel during suspension extension and compression while under operation. If the two arcs of travel are identical, the tires and steering wheel will not move as the suspension cycles. If the two paths are different, the control arm and tie rods paths will move in the opposite directions as the suspension cycles, and thus, "steering" the car differently when hitting "bumps". Zero bumpsteer is the result of all steering and suspension components being exactly the same length and on the same exact arcs. Rarely is this possible due to mounting options and space considerations in locating control arms, their length, and making everything equal. There is a certain amount of bumpsteer present that can not be changed, but their effects CAN be "moved around" to minimize the effect where it is most critical. And that is exactly what the R/T Super Joints do. There can also be a "bump" or movement in the steering when hitting a low speed bump. Ironically, this is not really bumpsteer. This jerky movement, or "shudder" like when hitting a set of railroad tracks at an angle is really a tight ball joint not letting the steering move, then breaking loose and then grabbing gain, which results in the shudder. Almost to the point you'd think a steering stabilizer would help. A set/ 4 ball joints replaces all upper & lower components. The Geometry correction version is the most popular & the Ultra Smooth version for maximum feel & performance. The special Installation Socket is a must if you do not have one. The Separator Tool presses out joints easily. The Adjuster Tool set is for expereinced professionals to re-adjusting the ball joint for normal wear if any clearance occurs. The Poly Ball Joint Boots come with our ball joints. 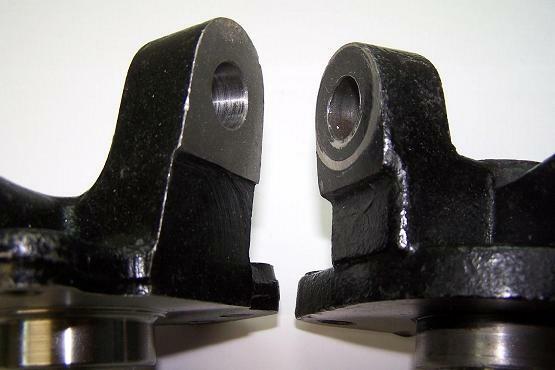 A note about "Roll Centers"
installing these Superformance specific ball joints!